In the not-too-distant past, oyster patties were a New Orleans party staple. 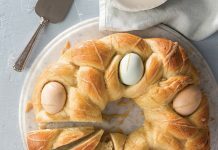 The dainty, buttery, oyster-studded pastries made the rounds at weddings, luncheons, and holiday get-togethers, flying off serving platters and delighting hungry guests. In the home of Louisiana Cookin’ reader Stephanie Laurent, these festive hors d’oeuvres never went out of style. 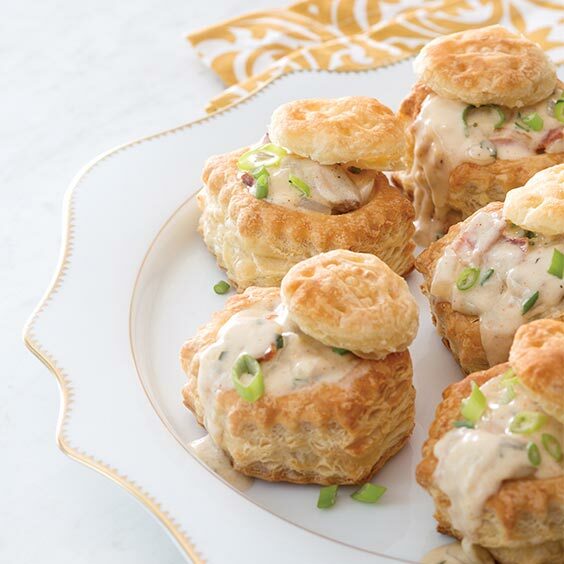 Also known as oysters vol-au-vent, Stephanie’s recipe for Oyster Patties is anything but old-fashioned. Earthy sage and smoky bacon update her version of the classic dish, while flaky puff pastry delivers an air of elegance. 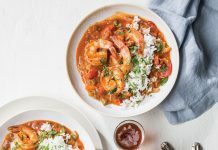 Serve these before Christmas dinner or pass them around as an appetizer at your next Mardi Gras party. Your guests will love them. In the same skillet, add 1/2 cup bacon drippings, and heat over medium-high heat. Add onion and garlic, and cook, stirring often, until onion is lightly browned. Add flour, and cook, whisking constantly, until roux is tan. Whisk in 2 cups oyster liquor,* cream, bay leaves, sage, and thyme. Bring to a boil over high heat, whisking constantly and scraping the bottom and sides of the skillet. Add oysters, bacon, parsley, cheese, and peppers. Turn off heat, and stir until edges of oysters curl. Remove from heat; remove bay leaves, and season to taste with salt. Fill shells with oyster mixture, and add pastry top; garnish with green onion, if desired. Serve warm. *We used Pepperidge Farm Puff Pastry Shells. If bacon drippings do not yield 1/2 cup, add melted butter. If oyster liquor does not yield 2 cups, add chicken broth. Man ole man! I haven’t seen these in a long long while. I love oyster anything. I will be trying this VERY soon. Thanks so much for sharing your recipe with me. This is a must in our family! I have never seen a recipe for oyster patties except for my grandmothers so this was a surprise to see. I have never tried it with bacon so this year I’m going to try it. Anybody have a recipe for Chicken-Oyster Pie? Great G’ma used to make it for Christmas – YUM!